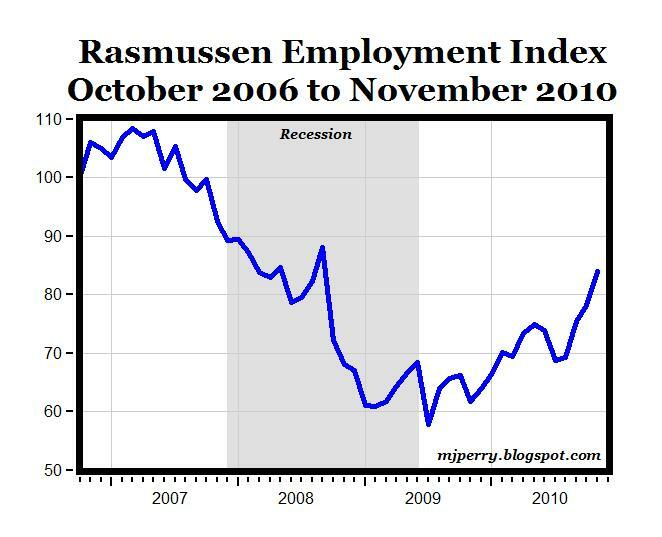 "The Rasmussen Employment Index posts its largest single-month gain in over a year and reaches its highest level since September 2008 for the third straight month. At 84.0, November's index is up six points from last month and 18 points from the beginning of 2010. The index, which measures confidence of workers in the employment market, is also up 22 points from a year ago when the index was 61.7 (see chart above)." MP: More evidence that while it might be slower than everybody would like, there is a gradual but real recovery happening in the U.S. labor market based on this index of worker confidence, along with the steady improvements almost every week this year in the ASA Staffing Index for temporary employment, and the gains in online job openings in almost every month since the summer of 2009, both reported earlier today. Bring on the real whiskey. Interesting to compare to Univ. of Michigan Consumer Sentiment Survey. The Consumer Sentiment Survey seems to fluctuate more wildly then the Rasmussen Index. This makes sense because not all consumers have jobs. The Rasmussen Index is a nice addition. and yet workers as % of population remains right about at 30 year lows. how do you square that with "employment recovery"? 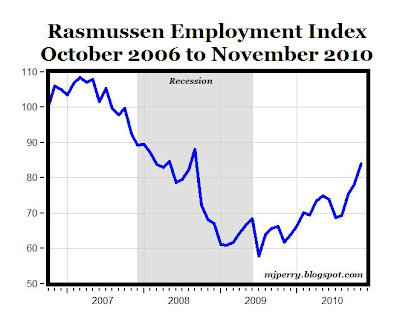 morganovich, it looks as though the Rasmussen Survey is a worker sentiment index. Thus, people who have jobs are getting more confidence in their present and future employment. The U.S. workforce is gaining confidence but this group needs some serious growth in size. And Challenger reports planned layoffs are at there highest levels in months. I still say peak unemployment rate has not been reached for this crisis.